Mie aceh or mi aceh is a spicy noodle dish, specialty of Acehnese people from Aceh region, Indonesia. The thick yellow noodle are served with slices of beef, goat meat or seafood, such as shrimp or crab. They are served in rich, hot and spicy curry-like soup. The bumbu spice mixture consist of black pepper, red chili pepper, shallot, garlic, cardamom, caraway, cumin and star anise. The noodle and spices are cooked with bean sprouts, tomato, cabbage and celery. Mie Aceh usually uses thick yellow noodles, in similar size to Japanese udon noodle. To ensure its authenticity, most of mie Aceh restaurant's noodles are home made. Mie Aceh is available in two variations; mie aceh goreng (fried and dry) and mie aceh kuah (soupy). Also two options of ingredients; meat (beef or mutton) or seafood (shrimp or crab). Usually sprinkled with fried shallot, and served with emping, slices of shallots, cucumber, and dash of kaffir lime. 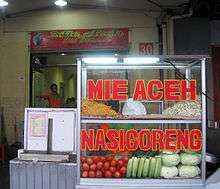 Mie Aceh restaurant, usually they also offers Aceh style nasi goreng and roti cane. Mie Aceh demonstrate the cultural history of Acehnese people and foreign influences that formed the Aceh region and its historic role as major port in the region. The curry-based soup obviously was the influence of neighboring Indian cuisine, while the noodle was Chinese influence. The preference to mutton, goat meat or beef demonstrate their Islamic value that requires halal food stuff. While the preference to seafood suggests Aceh geographic location surrounded by Malacca strait, Andaman Sea and Indian Ocean, also the way of life of majority of the Aceh population as traders, farmers and fishermen. Today, mie aceh eating establishments could be found in most of Indonesian major cities, and also neighboring countries such as Malaysia and Australia. ↑ "Aceh Noodle (Mie Aceh)". Indonesia Foods. Retrieved May 23, 2014. ↑ Ni Luh Made Pertiwi F (June 16, 2012). "Hmm... Kaldu Berempah Mi Aceh" (in Indonesian). Kompas.com. Retrieved May 23, 2014. Wikimedia Commons has media related to Mie Aceh.